Within a couple of years, the shop moved from push cart to a small 200 sq.ft. space opposite the Matunga Post Office near an Irani restaurant. In 1990, when the owner of the restaurant decided to close shop, he sold the 500 sq.ft space to Giri. Subsequently, Giri Trading Agency began selling puja items, curios, handicrafts, temple jewellery, and CDs of religious songs besides religious, spiritual and self-help books in a number of languages. Right from the beginning, Giri decided to take the help of his family in running the shop. Not only his wife Lakshmi who was a pillar of strength, but his growing children were also encouraged to help out during their spare time. This exposure would ensure that all his nine children were totally committed to their father’s dream of taking the Sanathana Dharma idea forward. Giri, however, knew the real big market was in Madras. So, in 1971, even while running the shop in Bombay, he decided to open Giri Stores, occupying 300 sq ft space on the ground floor of a building close to Kapaliswarar temple in Mylapore, where the shop is even today. A few years after the start of the Madras shop, Giri moved his wife and younger children to Madras leaving behind his elder children to look after the Bombay shop. Giri was a great believer in Ayyappa (one of his sons was called Ayyappan) and never failed to make the trip to Sabarimala every year. He decided to sell items required by pilgrims visiting Sabarimala, like the black dhoti and other related ritual paraphernalia. Simultaneously, the shop also began stocking items required for various other South Indian festivals, besides a whole range of traditional gift items, curios, handicrafts, temple jewellery and dance jewellery. Today, the shop inventory covers 1,50,000 products. The shop was by now on a fast growth track. Luckily another 2500 square feet in the same building became available in 1991 and was acquired. A small shop had transformed into a big “organised religious retail store”, paving the way for many more such stores in India. Today, Giri Stores has six branches in Mumbai, seven in Chennai and a branch each in Kancheepuram, Madurai, Coimbatore, Secunderabad, Bangalore and Delhi. There is a dealer representing the group in Australia and an office in Texas, U.S.A. There are over 400 employees working in these units. It also has a big warehouse occupying 15,000 sq.ft area in Mangadu, on the outskirts of Chennai. As a step towards backward integration, the group started a publication division with a printing press attached, to produce a number of religious books in different languages, again in-house. While Meenakshi, one of the sisters based in Chennai, looks after the printing aspect, Raman, elder to Ranganathan takes care of the entire publishing business. In 1990, the shop had already started bringing out a monthly religious magazine in Tamil called Kamakoti with the blessings of Kanchi Paramacharya. It continues to be published. Giri passed away in 1998 followed by his elder son Ayyappan in 1999. Ayyappan was a driving force and considered a man of ideas in the family. Though the double loss did affect the group, the surviving children of Giri, who were already involved in the business took charge and decided to take the legacy of their father forward. In 2000, the company converted itself into a private limited company, known as Giri Trading Agency P.Ltd., with all the siblings owning shares and each in charge of specific area of activity. Mrs Sharada Prakash, the eldest daughter of Giri, is now the Managing Director of the company. One of the most popular items marketed by the group is the ‘KOLUPADI’ – specially assembled racks looking like steps on which idols of various gods and goddesses are displayed during the Navaratri festival in Tamil Nadu. Kasi Viswanathan, the only non-graduate in the family but who is an engineer by instinct, designed a multipurpose product made of plastic which can be assembled as Kolupadis or as storage racks. This popular item accounts for almost five per cent of the total sales of the shop. How is the company facing the impact of technology on both their publishing and audio /video business? Ranganathan, who has a flair for technology, has an answer “Yes, when the digital technology came in, our remunerative audio-cassette business collapsed and we were in trouble. We took an early decision to go digital with our audio business by taking a number of initiatives. One of them is the concept of aggregating music and offering it to customers through an app. This allows them to download any song of their choice classified under a singer, music director, raga or even thalam. Special kiosks have been established in all the Giri shops where customers can do this and get the collection transferred to their thumb drives, for a fee. We have aggregated over 5,00,000 songs in our portfolio, covering religious, Carnatic and even film music. As a content aggregator, we are also available on other platforms like Youtube, I Tunes, Saavn, Spotify etc., besides providing the ‘ringtone’ facility. Though our products are available through online sites like Amazon, Flip Kart or Big Basket, they account for only five per cent of our sales. The company started using computerised billing from as early as 2000 and a few years ago it also introduced ‘bar coding’ of its products for better inventory control. The Company has regular training programmes for not only the staff at all levels but also the family members who attend special programmes to keep pace with the latest developments. Srinivasan, another sibling, is in charge of the sales of the entire group. Every year, he takes a group of selected staff on a trip abroad to participate in a festival at the Kamakshi Temple in Hum, Germany. He was instrumental in installing in this temple a 15 ft high statue of Lord Krishna. The group runs a family trust called ‘Lakshmi Giri Trust’ [Text Wrapping Break]encouraging first-time singers in classical and devotional music and dance. The Trust also supports a few Veda Patashalas in the city. Very recently, the Company acquired the rear portion of the building where the shop is currently located in Mylapore – increasing the floor space from 6,000 sq ft to 11,000 sq ft. A big leap forward! 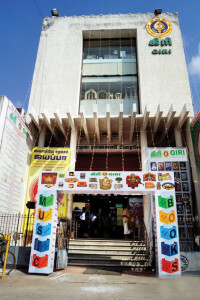 Giri Stores has now entrances to the shop from both the Kapaliswarar Temple side and from North Mada Street. While many multinational retail groups are biting the dust in India, it is good to see a local, religious retail chain doing well. 6818Why can’t ASI tend the Fort better?